With its 24 meters, the MCY 80 delivers pure cruising pleasure alongside an unparalleled ride and comfort experience for everyone on-board. Signature elements include a class-leading entertainment foredeck and Portuguese bridge that no other yacht in this size category can match. The flybridge, an iconic characteristic of the MCY range, can be equipped with a Jacuzzi, large bar area and sunbathing chaise lounges to create an exterior hideaway that is as luxurious as it is intimate. 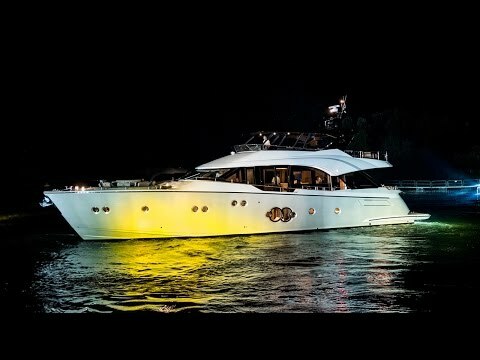 Like with the other yachts in the MCY collection, an instant sense of spaciousness both inside and out becomes immediately apparent upon boarding the MCY 80. The main saloon and the cabins are flooded with natural light and offer lushly appointed and detailed spaces for both social and private moments. The brushed and bleached floorings found throughout set an elegant ambiance that is further enhanced by precious leather and stone features. Design furnishing choices from the best World famous fashion brands from Italy and France complete an interior that is effortlessly modern and tasteful. 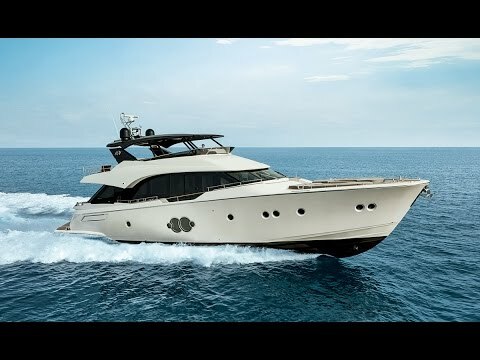 Monte Carlo Yachts’ defining tradition of combining visionary design with concrete results to create boats that combine the best of luxury and functionality with outstanding performance is exemplified in the MCY 80. The designers were faced with more than creating a great yacht, their challenge was to elevate the very concept of the MCY range to powerful and refined new heights. Agile and sleek, the MCY 80 was inspired by ideas of élan and finesse, which were translated into smooth exterior lines and shaped bulwarks that give it a curvy, modern look without being too sharp or minimalistic.